We have a genuine burden for ministers, Evangelist, church workers and everyday Christians who desire a higher education. Because of time constraints, inconvenience, or financial difficulties, many cannot attend a typical resident Bible College or seminary. Recognizing these restraints, I realized the need for seminaries. That dream seemed so far away. It appeared to be an unreachable goal. Nevertheless, as always, God provided the solution. In an almost overnight intervention from the Lord, our dream became reality and Bible Believers Christian College was born. 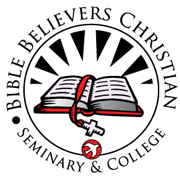 We are now officially known as Bible Believers Christian College and Seminary, Inc.
From theses beginnings we have grown until we have students from around the world. Our Lord has been faithful to send God fearing, people loving and faithful men and women to become a part of the staff of this great ministry. I cannot thank Him enough for the quality workers He as placed with us as our co-laborers in the execution of this complex task. May God bless you, and keep you.